How the high-risk, high-reward extreme sport helps conquer your fear of the deep through meditation. The boat, Enterprise, carries divers for a day of diving in cobalt and turquoise waters south of Dahab. Freedivers—a slightly mental group of thrill-­seekers who focus on holding their breath while descending into the open sea—have figured out how to stay underwater for 3, 4, or 5 minutes at a time. They say the key to the sport is to relax, that humans can override the urge to breathe underwater by learning to embody the energy that flows throughout the universe. They say you can stay under­water for minutes even after the first contractions of the diaphragm. A key motivation is to be more at ease in the water. Nine meters below the surface of the Red Sea, in my mask, wetsuit, and fins, I’m trying my best to do just that. But my lungs feel squeezed, as if in a vise. My arms and legs turn heavy as the blood vessels constrict. Every few seconds, my diaphragm heaves more intensely as the carbon dioxide increases. My brain feels fuzzy as the pressure in my head builds. The payoff for this seemingly crazy stunt, I’m told, is a euphoria unlike any other. Freedivers talk among themselves of being addicted to the sport. The body and mind are altered. Surface cares dissolve, replaced by a profound immersion in the present. It sounded great back on land, in the laid-back Egyptian village of Dahab on the eastern shore of the Sinai Peninsula. 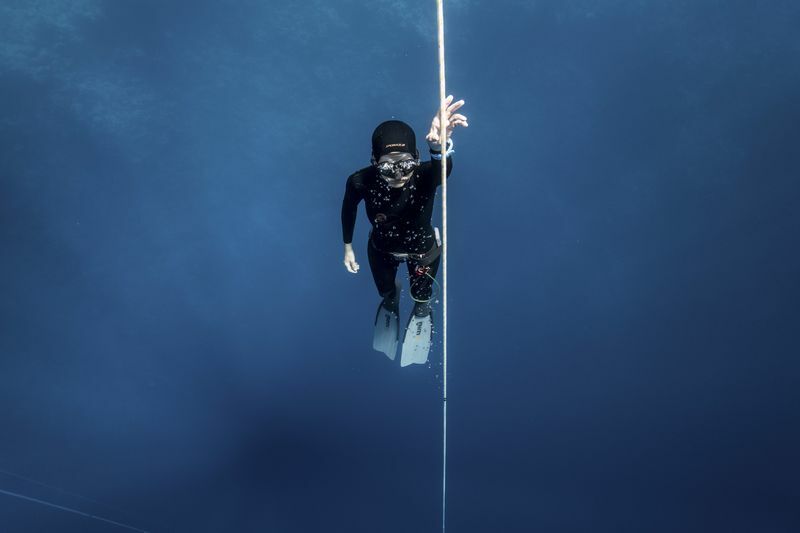 My instructor, the world-record-­setting freediver Sara Campbell, teaches Yoga for Freediving, a weeklong course that promises to unlock my potential. Our training begins with yoga and meditation in a sun-­speckled hut at the Coral Coast Hotel, timing our inhale with the mantra ong namoand our exhale to guru dev namo, meaning, “I bow to the divine teacher within.” Campbell tells us that at a certain depth, gravity will pull you down into the dark stillness and squeeze you in a loving hug. “It’s the one you have been waiting for your entire life,” she says. Underwater, it feels more like strangulation. I’d already gotten tangled in the rope that extends from a buoy at the surface. At a depth of 9 meters, I reach neutral buoyancy—too light to sink, too heavy to rise—and I’m supposed to hang out and chill. But after a minute and 20 seconds, the convulsions are overwhelming. I stare at the white-and-red rope through my mask with only one thought: I have to get to the surface, or I’m going to die. I climb up hand-over-hand toward the light and emerge gasping for air. 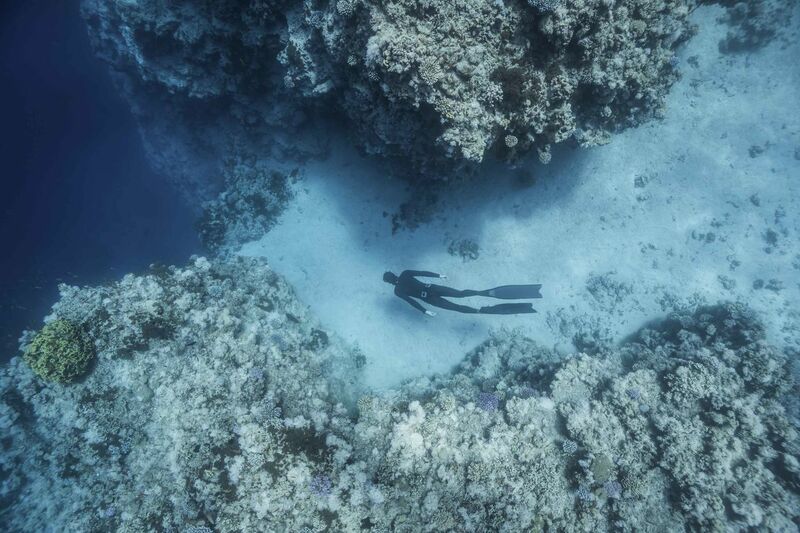 The Red Sea has ideal conditions for freediving: calm, warm, clear, and deep with little current. In ancient times, people dove to these sorts of depths out of necessity, to harvest shellfish, sponges, and pearls. Only after the mid-1940s did divers start competing to sink deeper. 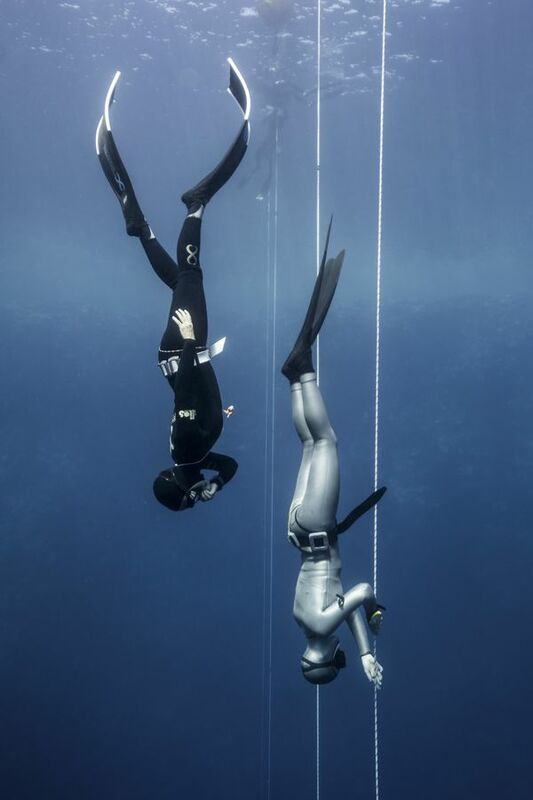 Interest in freediving rose after the 1988 movie The Big Blue, a fictionalized rivalry between two real-life European free­divers. Four years later a group of enthusiasts formed a volunteer governing body—the International Association for the Development of Apnea, or AIDA—to organize competitions and set protocols. Since the ’90s the sport has attracted a dedicated and growing number of divers who want to go underwater as deep, as long, and as far as possible on one breath. 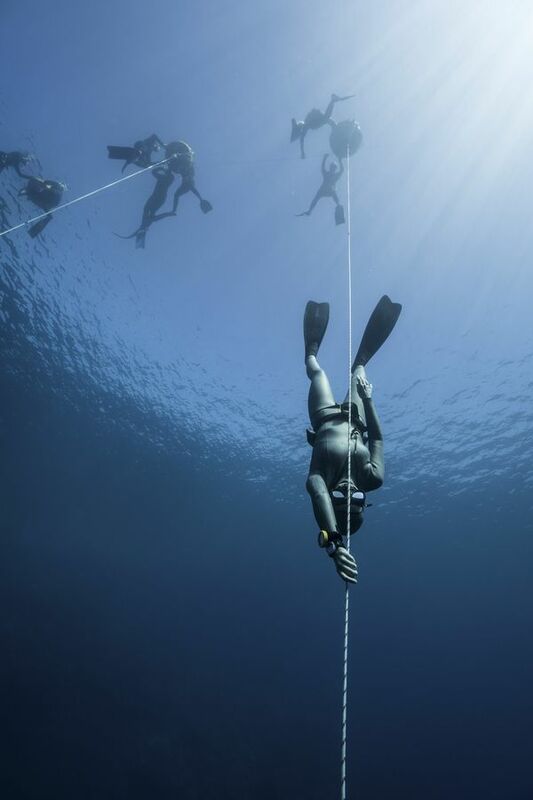 Most everyone has a 30-meter dive and a 4-minute breath-hold inside them, says Grant Graves, head of USA Freediving. 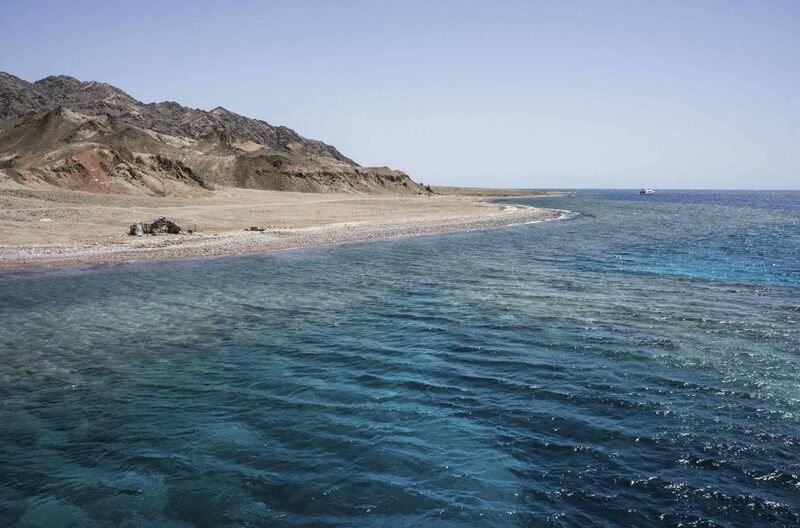 The freediving community has expanded in Dahab despite a drop-off in tourism in Egypt. Still, it’s a risky proposition. The enormous water pressure can cause ruptured eardrums and create lung-squeeze, which can result in internal bleeding. The lack of oxygen from an extended breath-hold can lead to blackout, most often just before or after resurfacing. Molchanov’s mother, Natalia, also a champion freediver, drowned after giving a lesson in August 2015 near Ibiza. She was 53. The payoff for this seemingly crazy stunt is a euphoria unlike any other. What makes Dahab a favorite, especially among Europeans, is convenience. Sharm El Sheikh International Airport is an hour south of the town. Rooms with a sea view can be had for less than $50, and it’s hard to spend more than $25 on a three-course fish dinner. Divers can plop down their gear a few feet from the water at dozens of open-air cafes with big cushions and the occasional stoned waiter. With its azure sea and jagged mountain peaks, the resort can lure visitors who arrive for a week to remain for years. It’s a popular spot for divers because of its storied Blue Hole, a large opening in a reef offshore that drops 91 meters. Locals call it a divers’ cemetery, because scuba divers can get lured in too far. But for freedivers, who descend and rise quickly, the conditions are perfect: The water is deep, clear, and warm, and has very little current. 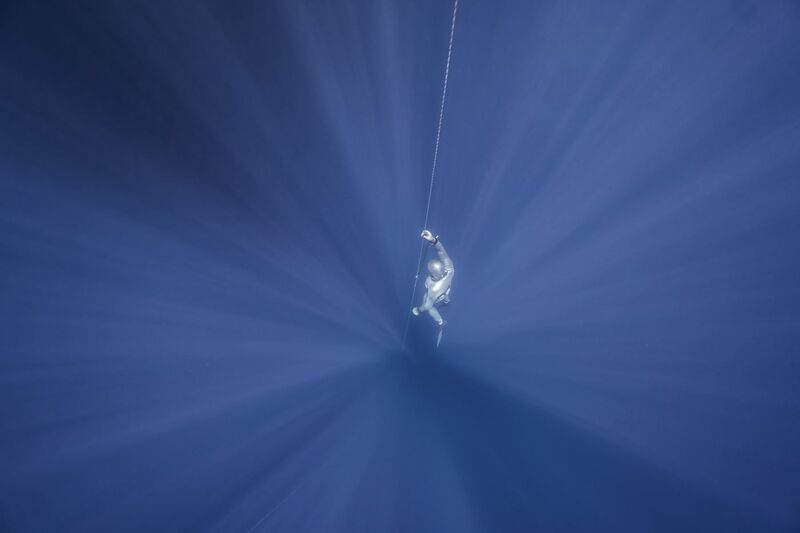 Campbell took up freediving a year into her new life, and after nine months of training, she broke three world records at the Blue Hole, including diving to 90 meters using a monofin, which looks like a mermaid’s tail. The enormous water pressure can cause ruptured eardrums and create lung-squeeze, which can result in internal bleeding. Kerry Hollowell, 41, a member of the US Freediving team and an emergency medicine doctor in North Carolina, is the most advanced diver in our group. She’s preparing for her goal of an 85-meter monofin dive, 10 meters deeper than her personal best, in the AIDA world championships this summer in Honduras. After that first panicky day, the revelations come easier. I find I can expand my lungs to a greater degree by breathing into my belly first and then up into my chest. I learn that a hooded wetsuit helps me stay warm and lead weights help me to descend. And I discover the point after neutral buoyancy where gravity takes over and pulls you down in a ­free fall. “Flying in the sea” is how one classmate puts it. I dive to 21 meters and stay under for 2 minutes and 26 seconds. But I keep forgetting to equalize on the way down; when my ears ache, I pinch my nose and blow too hard, causing “mask squeeze”—bright red blotches in the whites of my eyes from ruptured blood vessels. After that, I mostly use a nose clip instead of a mask. 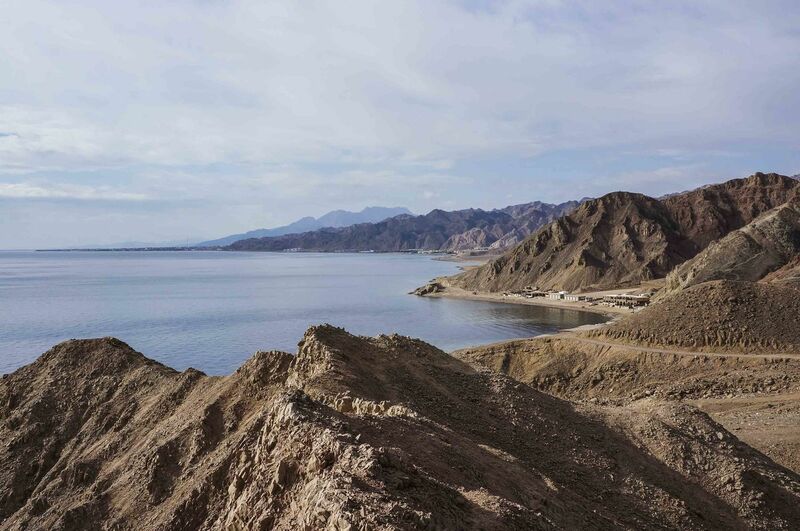 Dahab is a popular spot for divers because of the Blue Hole, a large opening in a reef offshore that drops 91 meters. Locals call it a divers’ cemetery. “Just let your inner dolphin out to play,” says Campbell. At 2 minutes, I picture my spleen releasing oxygen-filled blood to my core as my arms tingle. I wiggle my neck to release tension and still feel in command. At 2:30, my arms start to quiver, and my head feels lighter, squeezed harder. The contractions are coming faster and stronger. I pull back up the rope and feel a new reserve of air. My lungs and sinuses enlarge, giving me the sensation of being inflated with pure oxygen. It’s the closest I’ve gotten to that famous euphoria. And I don’t even know how deep I went. I pop up out of the water, catch my breath, and look at my watch: 2 minutes and 57 seconds. A personal best. 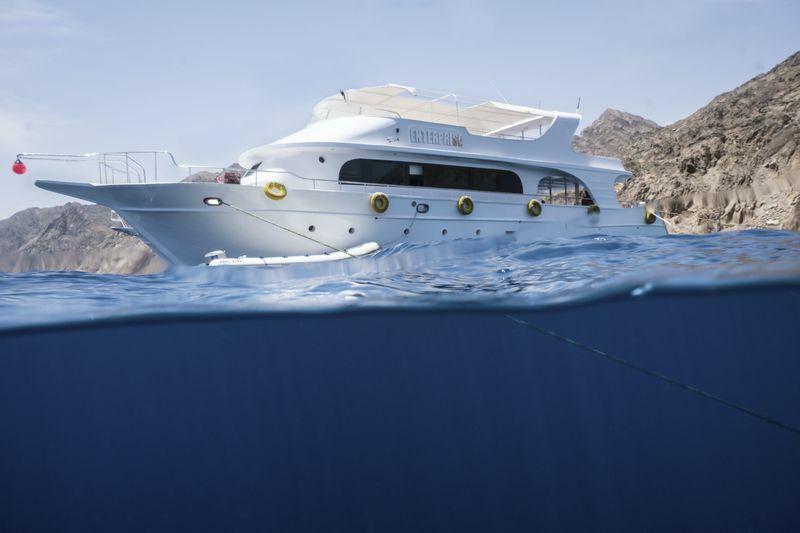 A six-day Yoga for Freediving course in Dahab starts at $775 per person. Fly into Sharm El Sheikh International Airport, a one-hour drive away. Standard rooms at the four-star Swiss Inn Resort range from $63 to $81. The Coral Coast Hotel (rooms from $34) is also popular with freedivers and scuba divers.